Despite being an awesome yet punishingly difficult NES game (and later SNES, Genesis, and more), Battletoads always had the stink of a late-to-the-party reaction to the runaway success of Teenage Mutant Ninja Turtles. Teenagers turn into green animals who fight to save the day from weird-looking enemies. There were a few points of differentiation that would probably hold up in recess-court: they were amphibians, not reptiles, and instead of a specialty weapon they could sort of morph into whatever tool they wanted to use. The humor was a little bit cruder, the characters were a little less cool, and the rogues’ gallery was way undersized, but the biggest disconnect between the two franchises was one of tone. 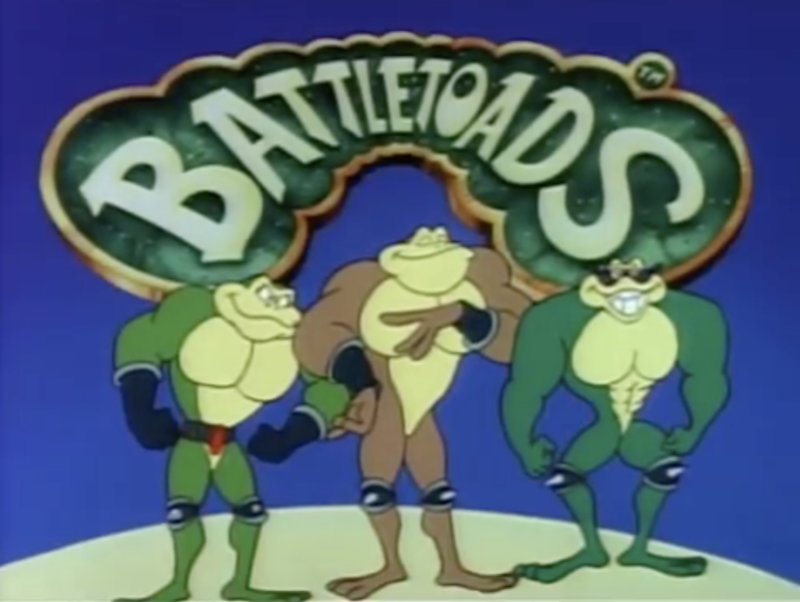 The story of the Battletoads didn’t feel relatable, unique, or even terribly interesting. 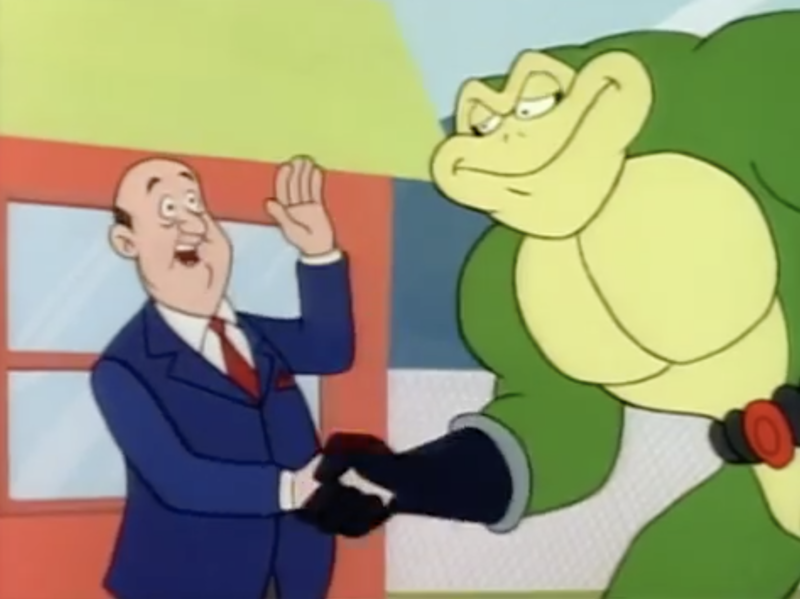 It’s the premise of Turtles meets the adventure of Mario meets the difficulty of Contra and all mixed together and diluted with water into a bland ’90s property. The cartoon pilot is proof of this; even with TMNT writer David Wise on board it’s an uninspired cash grab. This sort of effort may have had a better chance in the ’80s when there was more of an appetite for any show related a product regardless of quality, but the market was saturated with this sort of thing by the ’90s. The pilot aired during Thanksgiving weekend in 1992 and, despite Gamepro magazine’s assertations, never turned into an actual series. There are inspired moments to be found in the pilot, but you’ve really got to be looking for them. 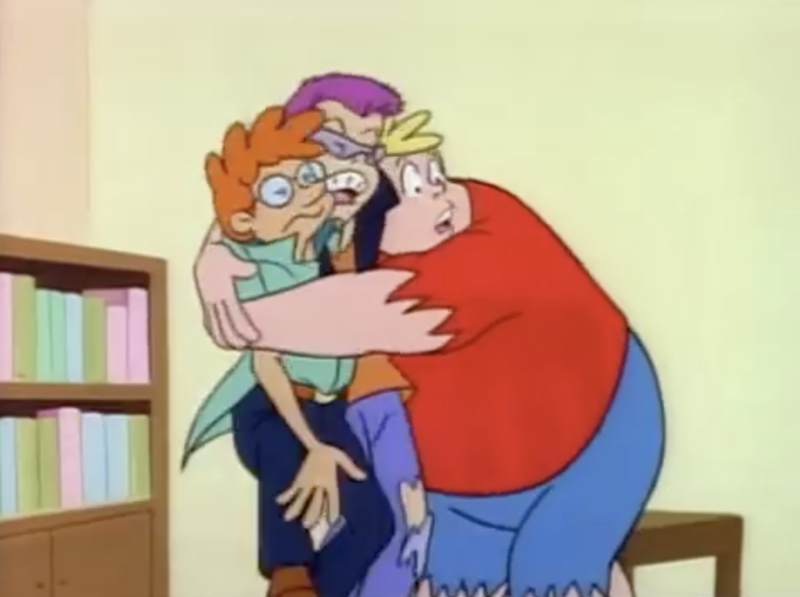 It aired as a “special”, the chance to see the origin story of these heroes from the video game, the story of how three unpopular nerds transformed into three somehow-already-named gigantic toads with superpowers. It starts (after an annoying surf-rock intro song) with Professor T. Bird and Princess Angelica under pursuit by the Dark Queen. The Dark Queen’s command center is one of those unintentional inspirations, a set barely detailed, lazy in its way but still beautiful in its minimalism and color design. Anyway. Cut to Earth, where three extremely unlikable and exaggerated stereotypes find themselves in trouble with the Principal and are forced by the Principal to never hang out with each other. That’s a thing? 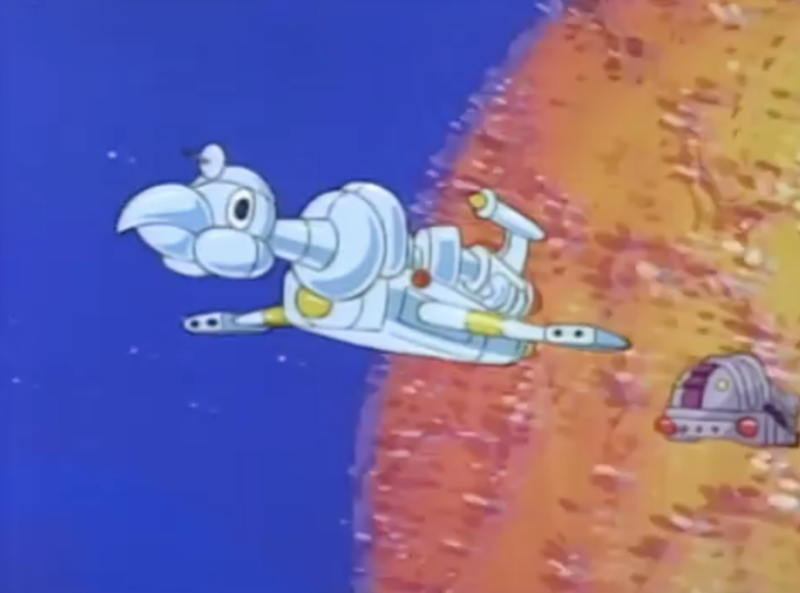 Back to space where the Professor and the Princess retrieve a serum that turns those who drink it into Battletoads, a race sworn to protect the royal bloodline. The Dark Queen and her minions descend upon them, the Professor pulls some science, and they escape to Earth. They run into the unlikeable kids, and the Professor basically tricks them into taking the serum. They don’t know they’re (permanently) turning into giant toads. This is a major violation of the teens’ rights, a glaring infraction that calls into question whether the Professor and Princess are truly “the good guys”, but the cartoon raises a minor kerfuffle about it and quickly moves on. The Dark Queen shows up and the Battletoads are called upon to protect the Princess. Let me be clear: up to this point the cartoon has been awful. In whatever world exists where this story needs to be told, the events up to this point have been more or less necessary. Everything past this is just hot garbage – senseless battle scenes with props that don’t actually do the damage that they’re doing , enemies that appear out of appliances, and a hot pink convertible that serves as a spaceship. 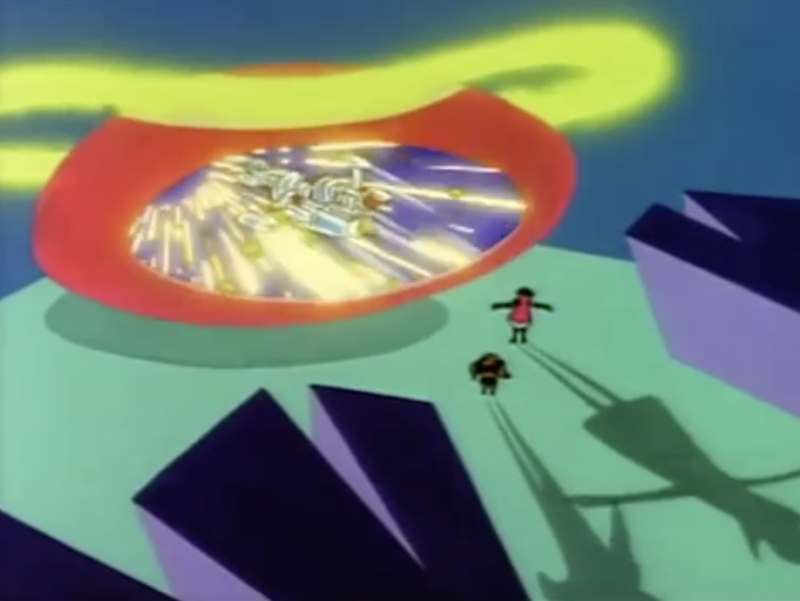 Oh, and there’s also a final attack from the Dark Queen herself that involves a sawtoothed spaceship that cuts into a mall. Soooo California. The Battletoads defeat the Queen (this time), and the day is saved. The kids redeem themselves in the eyes of the Principal, and everyone is ultimately okay with the permanence of the body morph that the teens have been put through without their consent. And that’s Battletoads! Tune in next week. Except not. It wasn’t picked up. Are you surprised? But, like I said, the games are good. Go to those to get your Zitz, Pimple, and Rash fix. Ugh. That’s your counterpunch to Renaissance artists’ names? Next Post Words Have Power – Read All About It (1979)!